One of a developer’s biggest time sinks is coming up with and writing accurate and engaging documentation. Even if it’s an internal project with.. well, just you… it’s still incredibly valuable to have: coming back to projects a few months or even years later can often lead to a bit of head scratching and screams of “why?”, especially with your own code. Whilst we’re not promising that CFWheels will write all your documentation for you, we have put some tools in place to hopefully make the process a little less painful. With a small amount of adjustment in how you document your core functions, documentation doesn’t necessarily have to be such a time consuming process. Following that link leads you to the internal documentation. This is a dynamically created set of documention created via javaDoc commenting in the main CFWheels Core. The three column layout is designed to allow for quick filtering by section or function name. On the left are the main CFWheels core categories, such as Controller and Model functions, which are then broken down into sub categories, such as Flash and Pagination functions etc. Clicking on a link in the first column will filter the list in the second and third columns with all the functions which match (including child functions of that category). Filtering by function name is made simple by a “Filter as you type” search field in the second column, so getting to the right function should be very quick. 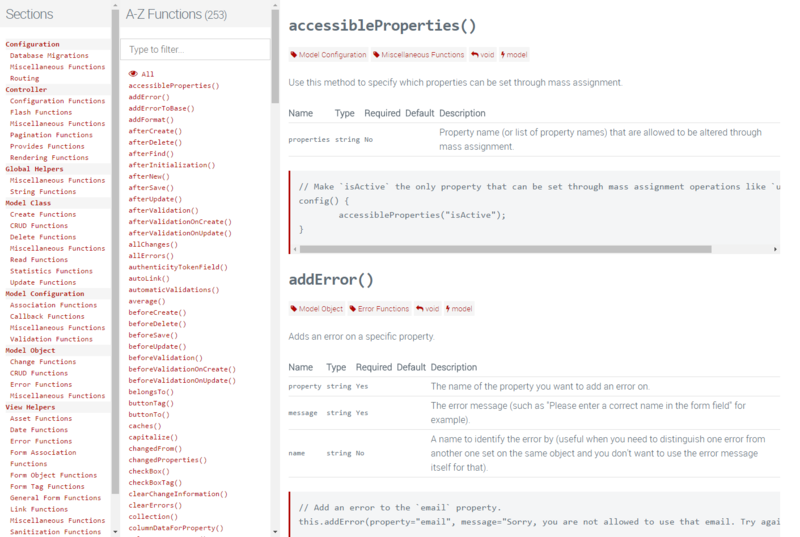 The third column contains the main function definition, including tags, parameters and code samples. Each function in the core is now appropriately marked up with javaDoc style comments. This, combined with getMetaData() allows us to parse the markup into something useful. Any function which is available to Controller.cfc or Model.cfc is automatically included; if there’s no javaDoc comment, then they’ll appear in uncategorized. But of course, there’s nothing stopping you creating your own [section] and [category] tags, which will then automatically appear on the left hand column for filtering: you’re not restricted to what we’ve used in the core. As an example, if you wanted to document all your filters, you might want to have a [section: Application] tag, with [category: filters]. This way, your application documentation grows as you create it. Something as simple as a sublime text snippet for a new function which includes the basic javaDoc skeleton can get you in the habit pretty quickly! We also introspect plugins for the same markup. We encourage plugin authors to adjust their plugin code to include [section: Plugins] at the very least. We do appreciate it will take a while for the plugin eco-system to catch up with this though. More on plugins later. You could also include the functions used to create the docs and create your own version (perhaps useful for a CMS or other application where you have internal documentation for authenticated users). Whilst this isn’t officially supported (the main functions may be subject to change!) it is technically possible. The best example is the thing itself – see the main output if you’re interested. Please note that the user interface isn’t available in production mode (for obvious reasons we hope! ), so if you wanted to expose this data to an end user, you would probably need to “roll your own” with this approach. Note that the CFC introspection doesn’t automatically happen on every request, so you will need to ?reload=true to see changes to your code. Additionally, Adobe ColdFusion is more aggressive in caching CFC metadata, so depending on your settings, you may not see changes until a server restart. Whilst the core has additional code samples which can be loaded from text files, there’s no support for your application functions to take advantage of this yet. Whilst this API/function explorer is a great first step, you’ll notice your controller and model specific functions aren’t included (only those shared amongst controllers, or in the /global/functions.cfm file. This is because we’re only looking at the main Model.cfc and Controller.cfc and what it can access. In CFWheels 2.1, we’ll look at adding a full Controller and Model metadata explorer using the same techniques, and map functions like show() to their respective routes too.